At last months Indianapolis Modern Quilt Guild meeting at The French Seam fabric shop, one of our fearless leaders, Rachael, encouraged me to join in the shop’s quilt challenge. 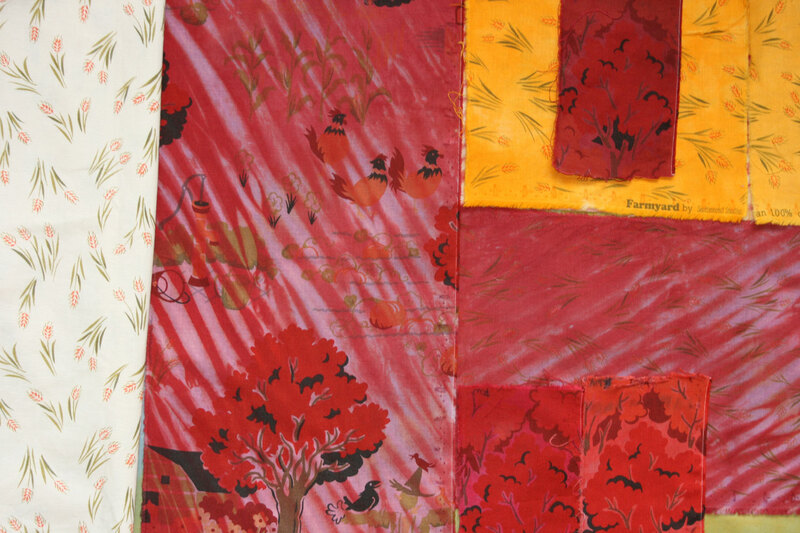 The challenge is simple use a piece of each of the three challenge fabrics to make a quilt. 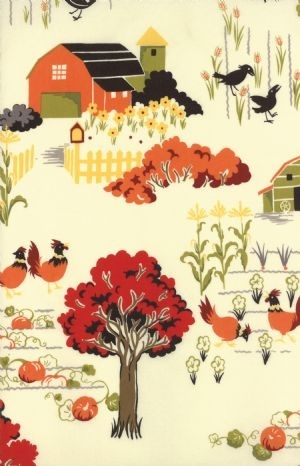 Sounds easy, but the fabric is … FARMYARD! That’s right, barns, chickens, crows, crops, etc. Definitely not my thing. So I’m overdyeing and removing color from the fabric to make it more palatable for me. What will come next I don’t know. But here are some of my results so far. By the way, LOVED the fabric shop! High end fabrics and they were so wonderful to us. They provided a cute project and supplies and a tower of the tallest iced cupcakes I’ve ever seen! I matched the red in the fabric and shibori overdyed a piece of the farm and tree fabric. I overdyed the wheat in the golden yellow but didn’t like the color as much as the red which covers up more of the pictures. So the yellow probably won’t be used in the quilt. 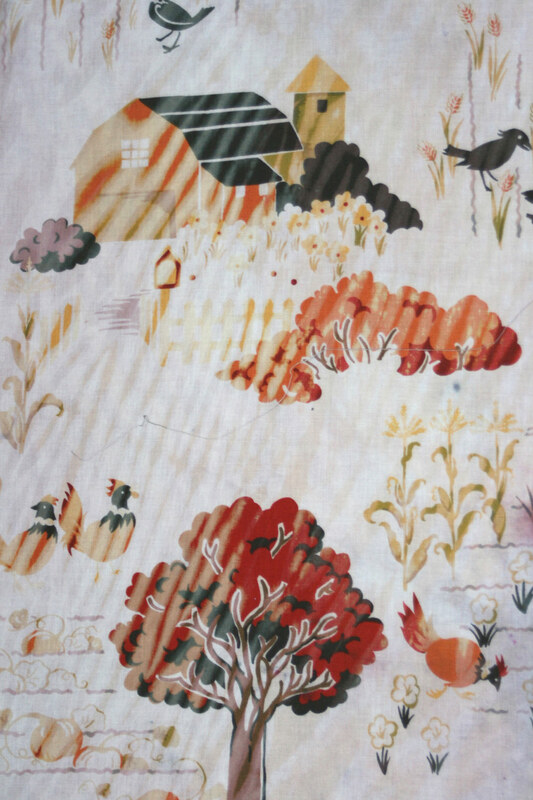 Overdyed Commercial Farm Print Dyed to Match the Red in the Trees. On the left is the wheat fabric and it is overdyed golden yellow in the top right corner. 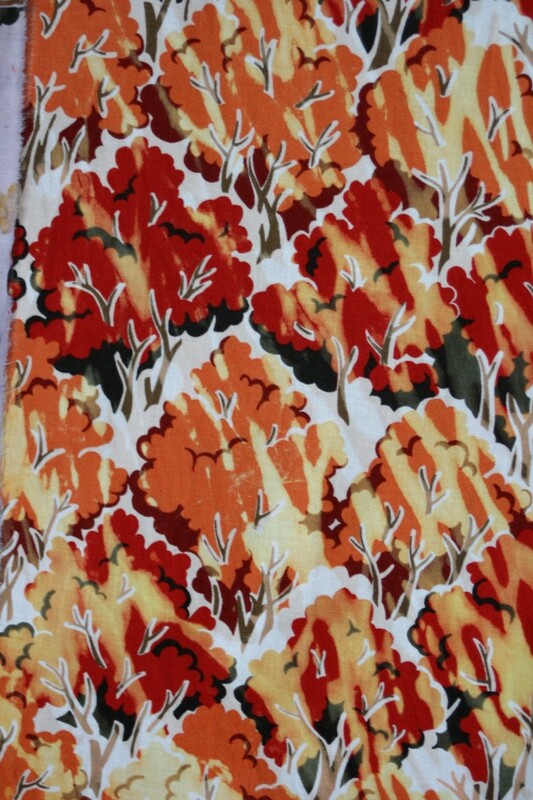 The allover tree fabric is shown in the small swatches that I overdyed. I bleached and removed color, but I wasn’t all that thrilled with the results of the dye removal with a stamp because it isn’t a drastic enough change and the bleached trees are lost. I do like the results of the shibori color removal, although still too bright and obvious for me. Maybe some more overdyeing. The allover tree fabric is more interesting to me with the shibori color removal. To overdye or leave alone next? 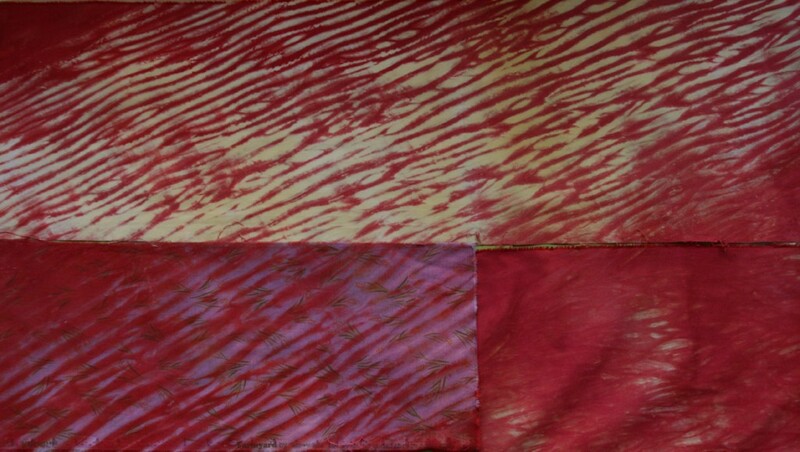 Here are some companion shibori dyed pieces that I did with the same dye stock as the farm fabric.